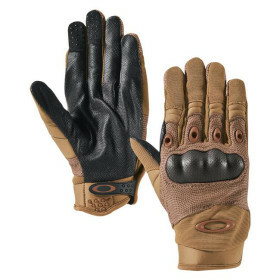 Oakley SI Assault Gloves (Coyote) » Protective Solutions, Inc.
Oakley SI Assault Gloves are designed with key features that professionals need. A sleek and covert profile allows for better control of weapons and tools. Rugged micro-vented leather palm and fingers reduce heat build-up and encourage more natural hand movement with a snug next-to-skin feel. Mesh zones and rubber exhaust ports increase breathability while working to push sweat vapor out. Raised carbon fiber knuckle plating provides enhanced protection. Premium materials are combined to implement all-over flexibility through articulated construction. A comfortable Airprene® fabric cuff with a rubberized, textured Velcro® pull tab is used for easy on and off.